Despite all of the buzz surrounding barefoot running at the moment, French footwear company HOKA has decided to go in the opposite direction. Called Hubbles, HOKA’s new line of super-cushioned trail shoes will debut in May. The Hubbles have a rounded sole shape for a continuous and natural heel to toe transition. The front of the shoe tips up for aid in push off. The underside of the sole is etched much like winter tires — each of the lugs morphs to the terrain, orienting itself for the best possible grip, the company touts. 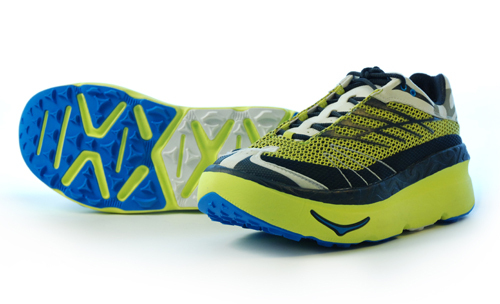 The key innovation in the Hubbles trail shoe is the dynamic cushioning property of the sole. As you run, the cushioned sole morphs to absorb the uneven ground, leaving no impact on your foot, the company says. The claim is that you feel as though you are running on flat ground. As you run downhill, the heel compresses, putting your foot in a more natural position. As you run uphill, the forefoot compresses to do the same, HOKA says. I tried on a pair of Hubbles at the Outdoor Retailer trade show in January. Those of you from Wisconsin will understand this reference — the shoes feel like running on a pair of foam Cheese Head hats. —Amy Jurries is founder and editor of TheGearCaster.com, a blog dedicated to profiling emerging companies and technologies in the outdoor sports industry.